This weekend, I get to go to Wilmington, North Carolina to photograph a wedding! YAY!!! But not just any wedding... Kristin and Drew's wedding at the Brookyln Arts Center, which is going to be GORGEOUS!!! This amazing couple found me on Google... gosh I love the internet, especially when it leads me to amazing people like them! 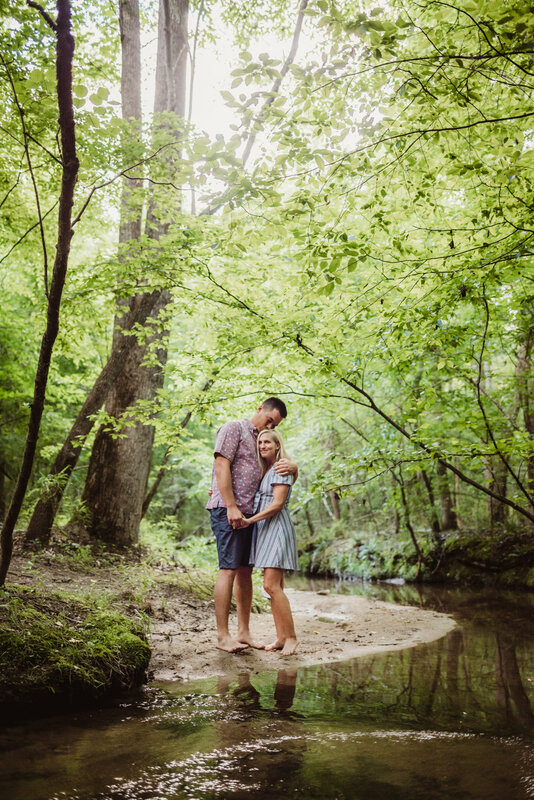 When I first met Kristin and Drew face to face, they drove all the way to Raleigh for engagement pictures... plus, you know, seeing Drew's family and making specialty kegs for their wedding. Super awesome things. We met at Mill Bridge Nature Park, right down the street from where I'm located and one of my favorite places to shoot. We were dodging rain clouds and thunderstorms, BUT we created awesomeness! There were ferns, waterfalls, creeks, lightning bugs, and lots and lots of bug bites. I mean, greenery. So, not gonna lie... I'm pretty pumped for this weekend!!! Drew and Kristin, who met in college and got engaged in Hawaii, where Drew is originally from, are amazing souls! Their laughter is infectious, their relaxed and chill attitude is refreshing, and their wedding is going to be pure joy. While I get ready to head down there, take a look at all the fun we captured during their engagement shoot! Want to create your own awesome memories?? Click here to book your session now!